Hey book lovers! 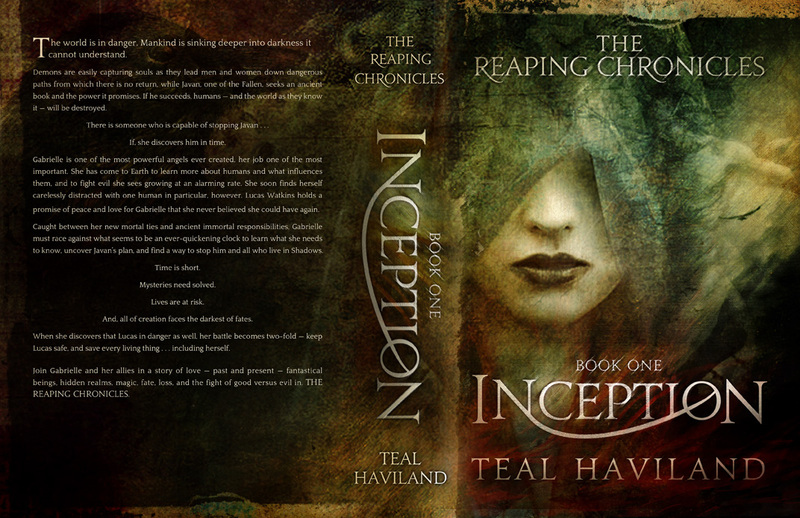 Today I have an awesome cover reveal for you guys, it's for INCEPTION the first book in 'The Reaping Chronicles' by Teal Haviland! Also below the awesome cover and book info there will be an character interview, so make sure to check that out also!! One of the most powerful angels ever created. A war spanning thousands of years approaching it's end. A past love who has fallen . . . a new one who is forbidden. And an ancient book that could cause creation's ruin. Gabrielle was created to live forever, but forever can’t exist when time is running out. Join Gabrielle and her allies in a story of love — past and present — fantastical beings, hidden realms, magic, fate, loss, and the fight of good versus evil in, The Reaping. CLICK 'READ MORE' TO CHECK OUT THE CHARACTER INTERVIEW! "Hi," I say as I try to calm my overly curious mind, "I'm Teal." “Of course. I did create you, after all,” I respond with a smile full of pride I think only an author can understand when sitting across from a character they birthed. Especially when that creation of fiction led to a birth of a different kind in my own life. This interview between author and character had not been planned. It came up suddenly when Gabrielle decided she wanted to know how she came to be, and thought the future readers of her story would also want to know. At first I wasn't sure about the idea, but now, as the Angel of Karma stands in front of me, I am glad for the opportunity. As we settle in our chairs, my desk separating us, I realize it‘s hard to dissect the expression of the angel sitting across from me. Nothing is readable in her eyes or demeanor. It makes me wonder what is going on in her mind, though not knowing and having the interview told through my point of view is something I agreed to when Gabrielle asked to do this. An open window behind me brings in crisp morning air. The telling of fall’s approach is being spoken by the breeze, but its chill is slowly warmed by a sun that's grown lazy after the work of summer. Leaves are less green as the reds, yellows, purples, and oranges spread across Tennessee, as if the colors are an army marching painfully slow toward a war they don’t want to fight. It’s mid October 2012, my favorite time of year, and I am less than four months from the projected publication date for Inception, the first book in the story of The Reaping Chronicles — Gabrielle’s story , and a story that I never knew was inside me until almost two years ago. I smile again, a bit more subdued. The way she came about was one of the most enlightening times of my life and one of the saddest. 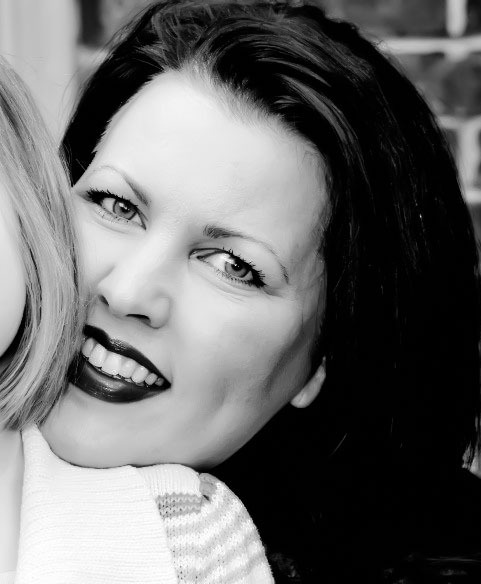 She was born from pain and anger and frustration and an extreme sense of a terrible injustice that was being done in the life of someone I cared about very much. But, she also saved me . . . literally. “Okay.” I take a deep breath before I begin, filling my lungs with air and my body with courage to tell my tale. I don’t like the spotlight . . . never have. But, when it comes to my writing I have discovered I am willing to step into it. I love what I am doing that much. “I have always been a strong believer in you reap what you sow. I have lived my life trying very hard to do what’s right. I sometimes fail, sometimes miserably, but I try. And I am a very spiritual person. During the year prior to coming up with you and the story of The Reaping Chronicles, however, I went through some horrible circumstances and there was a person who was getting away with heinous things, who had gotten away with many others over the years that I also knew about. I found myself questioning my beliefs. It tested my spirituality to an extreme, and I began to grow angry and bitter. That’s something that is never good for anyone, but particularly for me because I can be terribly vindictive and vengeful. It’s a side of me that I combat daily and it was beginning to win the war being waged inside me more every day.” I pause and take a deep breath, wondering if I am telling too much and considering how I will be judged for telling on that side of me. It’s a side I know most people have, but most also try to keep it hidden away behind facades. This is me, though. This is my story. Her mouth pushes up her cheeks as she smiles, but I see sadness behind the expression. I wonder how the story I have created has affected her . . . I wonder what she thinks of me. I laugh a bit at this. The reason is lame, and I know it. I don’t answer her right away. Instead, I look out the window of my home office at the trees as they toss in the wind, noting how much the leaves seem to change in the short hours between sunset and sunrise, as I ponder her question. I have wondered the same thing since I first walked away from my writing and photography and horseback riding — all of my passions — when I was almost seventeen. I have wondered, and have continued wondering because I have never come up with the reason that made sense to me. The answer raises one brow above her big green eyes. She seems to understand, even without explanation, and I wonder if she knows what I mean. After all, she was created from my mind. The same mind that was dealing with that internal war, the same one that found solace from the thoughts of revenge I was having that were consuming me like it was some starving carnivorous beast and I was the last meal it would ever eat. She, and The Reaping Chronicles, rescued me from those dark, nefarious places in my mind. Gabrielle is quiet for a moment, her eyes searching me, and I think about how I have written how her gaze made Lucas feel as I wrote intense scenes with them — the same gaze I am now under. The irony causes goosebumps to rise on my skin and I try to casually rub them away. 'Boy . . . she really is an intimidating creature,' I think, and the impression she is leaving on me is deep, because I know I'm not easily intimidated. Her lips part slightly in a smile as if she knows what I am thinking. 'Does she know?' And that thought causes the bumps on my arms to come back. “Wow,” is all I say for a moment. As we sit there, both of us waiting on my response, I try to figure out how to answer without sounding heartless. I realize I can’t. My heartbeat suddenly ratchets as I realize that, in fact, she is very aware of me — my thoughts, my emotions, my experiences . . . my life. More so than I was ready to believe. I am uncomfortable with this interview, now, but my shock at her shift quickly turns into reserved anger. I stand, and she mimics my movement. Without another word between us, she disappears in flowing, smoky white wisps. But . . . I swear her eyes are the last to fade . . . and they are shooting daggers at me. I don’t know what I expected from this interview, and I don’t know if I will ever let her do another one. But I can say that I was not expecting her to become so adversarial. I also find, while standing in my office in the moments after she left, that my anger easily softens. She is, after all, subject to my whims. She doesn't know how her story is going to end, yet, because I haven’t written it to its end. She only knows the content of the first book. I imagine she must not trust me. How can she? And, if I were her, I would be angry at me, too. She doesn't have any idea what I have in store for her, what trials and triumphs and failures I have in mind, obstacles I’ll put in her way, who and what she will lose or gain — how many more times I will have someone betray her or in what ways I will break her heart even more than she already knows I have. I am her creator, her ruler. And, in many ways . . . I am her Angel of Karma. Connect with the author of Inception, Teal!